Are Hunger Hormones Sabotaging Your Fat Loss? Leptin and ghrelin are two hormones that have a huge impact on your hunger levels and weight-loss success. Learn more about these hunger hormones and take control of your appetite! Millions of people go on diets every year, but by the end of the year, most of them have regained any weight lost and find themselves starting back at square one. After all, dieting is no easy feat, and it might even be harder than you think! Your body has an appetite, and if you consistently take in fewer calories than you burn, your body responds by revving up your appetite hormones, making you hungrier. It's not uncommon to hear names like insulin, testosterone, estrogen, and cortisol thrown around when talking about hormones that affect body fat. For example, insulin is often cited as a fat-storage hormone and criticized for being a key contributor to weight gain and obesity. While this is oversimplified and not entirely true, there are two hormones that may play a much larger and more direct role in weight gain and weight management: leptin and ghrelin. These two hunger hormones can directly affect energy balance and play a much bigger role in weight-loss success.1 If you want to improve your body composition and be successful with long-term weight management, understanding the role of these two hormones and how you can manipulate them is key! Leptin is considered the master regulator of hunger, and is known as your appetite suppressor. 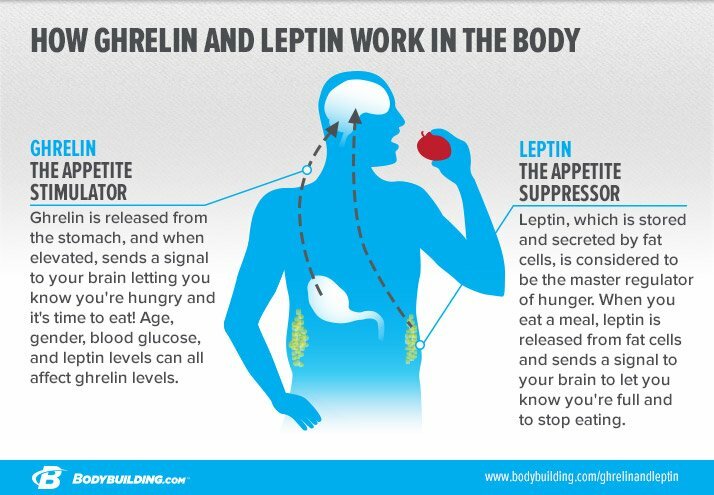 Leptin influences food intake due to its effect on the hypothalamus, a region of the brain that governs many processes and emotions such as hunger, thirst, sleep, and mood. Leptin influences food intake due to its effect on the hypothalamus, a region of the brain that governs many processes and emotions such as hunger, thirst, sleep, and mood. For these reasons, it's easy to understand why leptin plays a key role in long-term dietary adherence and success. Based on this information, you would think someone carrying around extra body fat would have more leptin, and thus, fewer desires to overindulge in food. This sounds great in theory, but research has shown that despite an elevation in leptin levels, obese individuals continue to overeat and energy expenditure fails to increase significantly. While cookies and snack cakes may taste good, they are typically less satiating than whole foods, they're extremely calorie dense, and they provide little nutrition to your diet. Regular exercise plays an important part in improving leptin resistance and decreasing inflammation.6 Make sure to include resistance and high-intensity interval training, which will not only help control leptin levels, but are great for building muscle and burning fat. Regular exercise plays an important part in improving leptin resistance and decreasing inflammation. Make sure to include resistance and high-intensity interval training, which will not only help control leptin levels, but are great for building muscle and burning fat. If you need a complete workout regimen, check out Find a Plan, which has complete training, nutrition, and supplement programs for your specific needs. Along with helping you feel fuller longer, protein may also improve leptin sensitivity.7 Aim for 30 grams of lean protein per meal. This can include chicken breast, white fish, tofu, or lean ground beef. Alongside the abundant benefits of a good night's sleep, logging eight hours of shut-eye on a regular basis may also help improve leptin sensitivity.8 If you struggle with falling asleep, try some of these tips: Set a regular bedtime, turn off your TV or computer thirty minutes before you hit the sheets, make sure your bedroom is dark, keep outside noise down, and turn down your thermostat to around 65 degrees. Factors like age, gender, BMI, blood glucose levels, insulin levels, leptin levels, and growth hormone (GH) have been shown to affect ghrelin levels. Leptin itself, for example, can help reduce ghrelin. Furthermore, if you often find yourself feeling full after a tough workout, it could be because of an increase in GH, which can help dampen hunger and food intake by reducing circulating levels of ghrelin. If you continuously diet or have dieted several times in the past, it's likely that your baseline ghrelin levels are elevated. This could be bad news if you want to stay lean year-round or diet again in the future. While the research on ghrelin and diet is limited, recent studies have shed some light on potential dietary strategies that may help to control your appetite and fight the grehlin gremlin. A sensible approach to calorie cycling may be a 4- to 6-week dieting phase with a 1- to 2-week period at caloric maintenance. Short calorie-cycling diets may be a novel strategy to help control some of the metabolic adaptions to weight loss. For example, prolonged dieting reduces leptin and increases ghrelin. By doing shorter blocks of dieting interspersed with higher-calorie blocks, it may be possible to offset some of these adaptations. A sensible approach to calorie cycling may be a 4- to 6-week dieting phase with a 1- to 2-week period at caloric maintenance. If your maintenance calories are set at 2,700, you'll likely be consuming around 2,200 calories during your dieting phase before returning back to 2,700 for a couple weeks to give your body a break. Along with supporting leptin and ghrelin levels, this strategy may also provide psychological benefits. By breaking your diet into smaller chunks, it becomes easier to focus and adhere to, compared to a 12-week (or more) continuous diet. One of the few studies on this topic to date investigated minicycles of 11 days dieting and 3 days at maintenance versus continuous dieting.16 Despite total calorie intake being the same between groups, the group that dieted for 11 days and maintained for 3 days lost more weight! Interestingly, these individuals even kept the weight off during the maintenance phase. 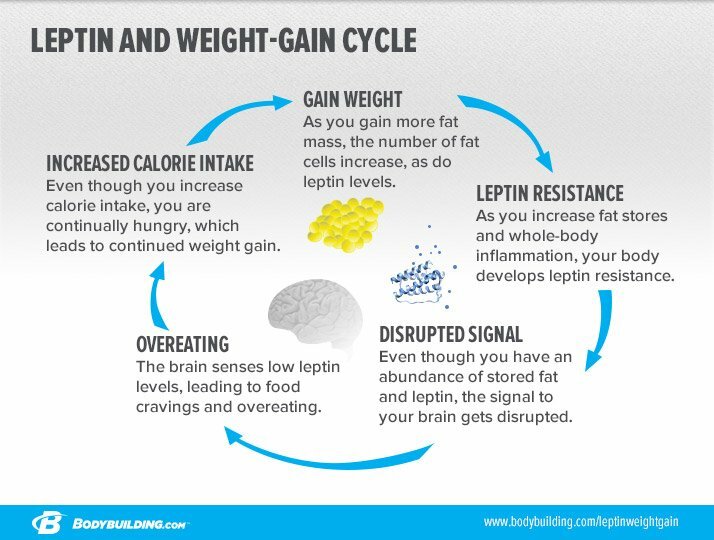 Both leptin and ghrelin levels are key for weight management and successful dieting. Yo-yo dieting will most likely have a long-term negative impact on hormones, body composition, and general health. To avoid the vicious cycle of losing weight and then regaining it, plan in periods of energy maintenance or refeeds. These can be small periods of 3-4 days every two weeks or longer, or one-week periods every 4-6 weeks. While dieting may feel hard, research shows the maintenance period afterward may be even harder! Make sure your post-diet plan is as optimal and effective as the actual diet itself. Aim for 20-30 grams of protein each meal, and don't ditch the gym. Exercise is key! Applying the strategies listed above will help you maintain leptin and ghrelin health, but it's critically important that you plan your diet ahead of time, set clear goals, and be patient with the process. If you're going to try cyclical dieting to help your leptin and ghrelin levels, give yourself plenty of time. Klok, M. D., Jakobsdottir, S., & Drent, M. L. (2007). The role of leptin and ghrelin in the regulation of food intake and body weight in humans: a review. Obesity Reviews, 8(1), 21-34. Lindqvist, A., de la Cour, C. D., Stegmark, A., Hakanson, R., & Erlanson-Albertsson, C. (2005). Overeating of palatable food is associated with blunted leptin and ghrelin responses. Regulatory Peptides, 130(3), 123-132. Pelleymounter, M. A., Cullen, M. J., Baker, M. B., Hecht, R., Winters, D., Boone, T., & Collins, F. (1995). Effects of the obese gene product on body weight regulation in ob/ob mice. Science, 269(5223), 540-543. Münzberg, H., Björnholm, M., Bates, S. H., & Myers Jr, M. G. (2005). Leptin receptor action and mechanisms of leptin resistance. Cellular and Molecular Life Sciences, 62(6), 642-652. Jung, C. H., & Kim, M. S. (2013). Molecular mechanisms of central leptin resistance in obesity. Archives of Pharmacal Research, 36(2), 201-207. Reseland, J. E., Anderssen, S. A., Solvoll, K., Hjermann, I., Urdal, P., Holme, I., & Drevon, C. A. (2001). Effect of long-term changes in diet and exercise on plasma leptin concentrations. The American Journal of Clinical Nutrition, 73(2), 240-245. Spiegel, K., Leproult, R., L'Hermite-Baleériaux, M., Copinschi, G., Penev, P. D., & Van Cauter, E. (2004). Leptin levels are dependent on sleep duration: relationships with sympathovagal balance, carbohydrate regulation, cortisol, and thyrotropin. The Journal of Clinical Endocrinology & Metabolism, 89(11), 5762-5771. Cummings, D. E., Purnell, J. Q., Frayo, R. S., Schmidova, K., Wisse, B. E., & Weigle, D. S. (2001). A preprandial rise in plasma ghrelin levels suggests a role in meal initiation in humans. Diabetes, 50(8), 1714-1719. Hays, N. P., Bathalon, G. P., McCrory, M. A., Roubenoff, R., Lipman, R., & Roberts, S. B. (2002). Eating behavior correlates of adult weight gain and obesity in healthy women aged 55-65 y. The American Journal of Clinical Nutrition, 75(3), 476-483. Cummings, D. E., Weigle, D. S., Frayo, R. S., Breen, P. A., Ma, M. K., Dellinger, E. P., & Purnell, J. Q. (2002). Plasma ghrelin levels after diet-induced weight loss or gastric bypass surgery. New England Journal of Medicine, 346(21), 1623-1630. Rossow, L. M., Fukuda, D. H., Fahs, C. A., Loenneke, J. P., & Stout, J. R. (2013). Natural bodybuilding competition preparation and recovery: a 12-month case study. International Journal of Sports Physiology and Performance, 8(5), 582-92. Parnell, J. A., & Reimer, R. A. (2009). Weight loss during oligofructose supplementation is associated with decreased ghrelin and increased peptide YY in overweight and obese adults. The American Journal of Clinical Nutrition, 89(6), 1751-1759. Sumithran, P., Prendergast, L. A., Delbridge, E., Purcell, K., Shulkes, A., Kriketos, A., & Proietto, J. (2013). Ketosis and appetite-mediating nutrients and hormones after weight loss. European Journal of Clinical Nutrition, 67(7), 759-764. Dirlewanger, M., Di Vetta, V., Guenat, E., Battilana, P., Seematter, G., Schneiter, P., ... & Tappy, L. (2000). Effects of short-term carbohydrate or fat overfeeding on energy expenditure and plasma leptin concentrations in healthy female subjects. International Journal of Obesity, 24(11), 1413-1418.